As we are planning our new 2019 season here at Kerns Nursery, we welcome you to our website. We hope that you will be visiting our Nursery and Gardens this Spring, Summer and Fall. Before anything, here is our new 2019 list of 548 Annual Plants and our 2019 list of 124 Vegetables, including many tomatoes. Coming up soon: our 2019 lists of Perrenials. We are fortunate to maintain the same great knowledgeable and helpful staff to help you with your decisions. Many have been with us for quite a while. Here at the nursery we grow almost all of our annuals and perennials right in our own greenhouses. By working with these plants, all our growers and sales staff really understand the dynamics and characteristics of over 1,000 varieties. We stay on the latest trends, bringing to our sales space the best material offered in the market today. Whether a small home garden or a large master landscapers plan, we will work with your needs. Kerns has access to ordering native plugs for large scale planting. We can help you choose a color pallet for your planters or the plant that fits any of your unique conditions. WE ARE A SMALL NURSERY WITH A BIG GARDENING HEART… OFFERING SO MANY SELECTIONS …way beyond the big box stores !!! For your landscaping needs Bob and his experienced crew are taking on new jobs. Working with integrity and creativity on landscape design and installation for over 40 years, Bob not only knows how to work with the right plants, but also knows how to shape the land, add rock features, patios, walkways, etc. making your property not only look great, but function well also. 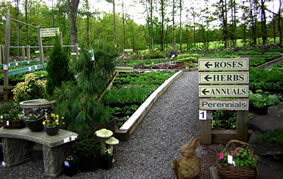 So come visit Kerns Nursery located in the beautiful Northern Catskill Mountains, in Jewett, between Hunter and Windham NY. Take a Drive to our Mountain Top, tour our gardens, bring a picnic to our gardens, take a hike, enjoy a great lunch or dinner at one of our amazing near by restaurants and bring home SOME PLANTS! POTTERY: We have redone our pottery displays to presenti to our customers a great variety of quality pottery in various sizes, shapes, forms, and prices. We use many vendors and put much time to carefully selecting our lines of pottery – including, stone and cement benches, fountains, bird baths, sculpture and of course pots, pots and more pots! We realize many of our customers are second homeowners and may not have time to make a commitment to large scale gardening projects. At least there is the world of POTS! Plant some yourself or if not have us plant them. I plant most all the combination planters personally in the nursery that we sell and many, many for custom orders. Having a background in art and after planting thousands of pots over the years – I have some good combos in mind. Color both in foliage and flower – height, shape, form are all whirling around in my head. Part heavy thinking, part foraging among all our choices, but mostly my instinct has evolved with 40 years of experience. Pot planting is a real forte of mine. So if you just want to enjoy, we can plant for you! OUR SHOP: We do the best we can to hold together as a complete nursery that addresses many of your seasonal outside living concerns. Therefore we carry cedar furniture, gardening tools, fertilizers, soils, mulch and other supplies needed to take care of your gardens. The shop also contains many items that we find special for one reason or another. I think we carry the best hand care product there is. We have some fine gifts, jewelry, pillows, vases, candles, and more. OUR GARDENS: Just to remind everyone are garden are open to the public when we are – except on odd occasion. We hope to give our customers many ideas on how to plant and what to plant. (How to use color and height. How to plant for the changing seasons) Perennial gardens change from week to week, so there is always something new to see. Our annual gardens act as a display and test area for the varieties we carry. 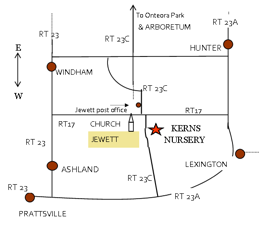 We hope you enjoy the excursion to Kerns Nursery. The drive is beautiful heading up the mountaintop. Come to buy plants, but take a moment to enjoy the vast garden areas. Our neighboring towns have some fine restaurants to complete a great day trip. OUR PRICING: We have done the best we can to keep our prices in line with the standard market prices and in many cases we offer a better price. WEDDINGS: Over the years we have evolved into the weddings business on the spectacular Catskills Mountaintop. We now offer to stage a wedding on our property in the perennial garden area. Please contact Pat at 518-734-3543 for any inquiries. LANDSCAPING: Bob has been landscaping on the mountaintop since 1973! Along with our crew of diligent workers, Bob and I have worked together in planning and installing so many different projects in our area over the years that it’s easy to say we do know what we are doing. We guarantee the trees and shrubs we plant for a year to assure our customers that the landscape we install is appropriate for our hardy mountain weather. Landscaping takes good instinct, a very special sense of design and space, knowing your materials and innovative thinking. Its more than dropping plants in the ground. 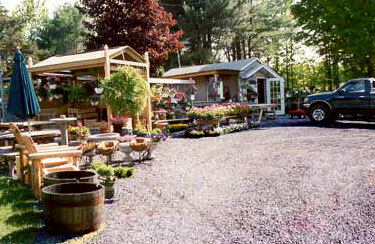 For a first class landscape design and application KERNS NURSERY is the only choice. 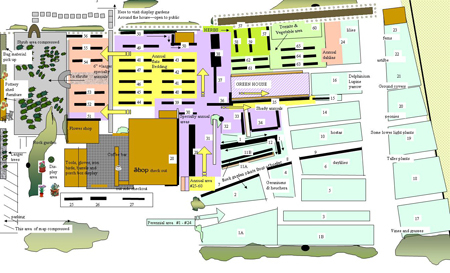 We hope that you will find us a completely unique and a special place to shop and spend time in. It’s been a long road to get us where we are today on our back road here in the little town of Jewett. Welcome to Kern's Nursery if it's your first visit. We'll show you around! Thank you to all our repeat customers who have supported us over the years. We hope to see you in Jewett this 2019 season! The Nursery started in 1987, but the Kerns’ have been involved in landscaping for over 30 years. Pat says “When we started the nursery we were so small it was ridiculously funny, and being off the main roads didn't’t help, but as word of mouth spread our business has continually gotten bigger and bigger. We now have a large and very unique nursery, where the environment you shop in is like a well cared for garden – not a supermarket. More than that, we are a nursery for gardeners because the plant selection we offer makes it worth coming from a good distance away. Prior to owning a nursery, I would have traveled to a place like this myself. We have regular customers from places like Albany, Cooperstown, Rhinebeck and Woodstock. Many second home owners buy not only for their Mt. Top house, but bring plants to their main residence down state New York as well as New Jersey, Connecticut, Massachusetts and Pennsylvania not to mention many summer tourists that pass by every year or so from all over the country. It’s very inviting here. Beyond the typical expectations you normally find while plant shopping, here you’ll find the pleasant environment captivating and the help attentive and knowledgeable.